Andy is a Senior Software Engineer that has sixteen years of experience working on web, desktop and mobile applications. He holds a Bachelor and Master's degree in Computer Science from the University of Virginia and George Washington University respectively. He specializes in working with Java web services and has significant experience working web applications, databases and continuous integration and deployments. He is currently working as a technical lead at a financial technology organization where he supports mobile application services in Java. With the rise in popularity of micro services we have seen a similar rise in popularity of applications with embedded servlet containers. 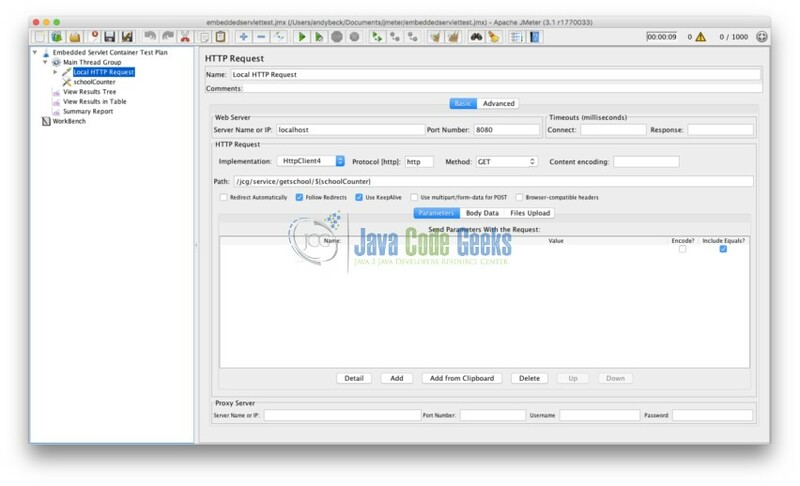 Spring boot is a Java based framework that supports application services. It runs as a standalone jar with an embedded servlet container or as a WAR file inside a container. In this example, we will focus on the standalone jar with embedded servlet containers. The framework supports three different types of embedded servlet containers: Tomcat (default), Jetty and Undertow. We will compare the three and look at differences in properties, settings, performance and memory. Keep in mind that this example is analyzing the default configuration. There are many ways to optimize the performance or memory usage including to customize the auto configuration and component scanning. We used Eclipse Neon, Java 8, Maven 3.3.9, Spring 1.4.3, Tomcat 8.5.6, Jetty 9.3.14 and Undertow 1.3.24. We will use Maven to setup a new project in Eclipse with the appropriate dependencies. We will use the starter parent for this example but the dependencies in a production application will likely be altered to streamline, optimize or customize. The default embedded servlet container is Tomcat. This version of Spring Web 1.4.3 brings in Tomcat version 8.5.6. To setup the Spring Boot application you include the @SpringBootApplication annotation in your Main class. The @SpringBootApplication annotation brings in @SpringBootConfiguration, @EnableAutoConfiguration and @ComponentScan annotations. You may choose to eliminate this annotation and add the @SpringBootConfiguration alone or to another class that allows you to customize the configuration. The @ComponentScan will scan your application for items like the @Controller you will need to setup a RESTful service. The following controller will return a simple “Hello World” string from a HTTP GET request. We have also included in the bundled example another endpoint mapping that returns a complex object type. The default properties for all the embedded servlet containers are the same. Some of the most important properties to consider are the properties for configuring startup information like ports and application name, TSL, access logs, compression and many more. For example, to configure SSL add the following to key value pairs to the application.properties. To explore the parameters for Spring boot applications you can add the Spring actuator dependency and the @ConfigurationProperties annotation to your Main class. You then visit the /configprops endpoint on your application to get a list of the available properties. The embedded servlet container versions are defined in the following parent dependency from the pom. You can change the version of the embedded servlet container by explicitly including the dependency and identifying a new version in the pom. We will show you how in the examples below. As Tomcat is the default embedded servlet container there is nothing you need to do to the default implementation to use Tomcat. You can change the version of Tomcat you are using or change properties in the pom.xml or application.properties files. To change the embedded servlet container to Jetty you need to edit the pom file to remove the Tomcat dependency and add Jetty. To change the embedded servlet container to Undertow you need to edit the pom file to remove the Tomcat dependency and add Undertow. Notice the undertow version included in the spring boot starter is incorrect, referring to 1.3.25. You’ll need to change it to 1.3.24.Final for this to work at the time of this article. In this example, we will analyze both the peformance of HTTP requests and the memory footprint at startup of all three embedded servlet containers. 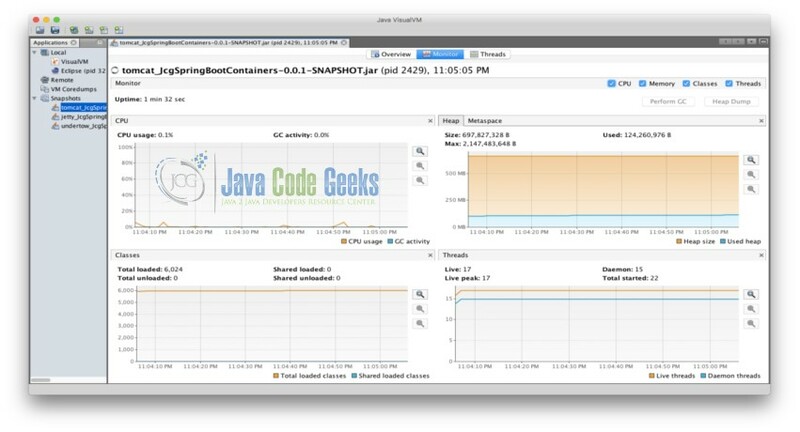 We used JMeter to measure performance by simulating load and JVisualVM to look at the memory footprint. In this example, we will analyze both the peformance of simple RESTFul GET requests that return a string and more complex GET requests that return complex JSON objects. JMeter is the tool used to measure the performance of the the three different types of containers. The key to setting up this test was establishing thread groups with the appropriate load, a counter to dynamically update the input to the API and report viewers to display or aggregate the results. For the simple string examples, we used a thread group with 1000 threads that would loop 3 times through the sequence. It also used a ramp up time of 10 seconds. For the complex object examples, we used the same parameters but did not loop. To measure the memory of each embedded servlet container we looked at the memory usage on startup. 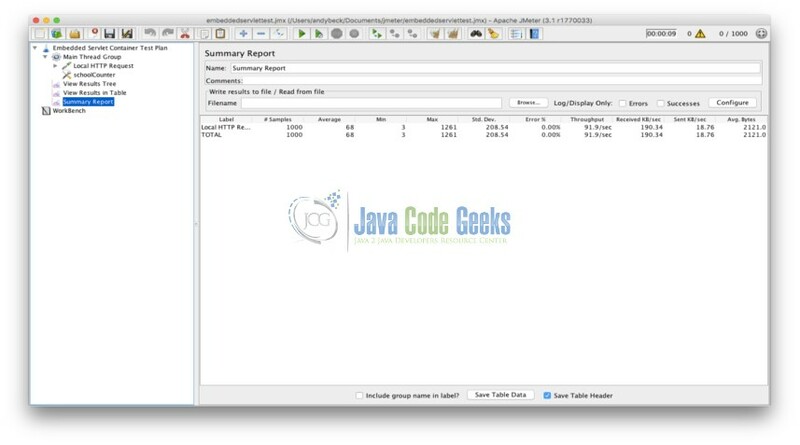 JVisualVM is a tool provided with the Java Development Kit for visualizing the memory and footprint of java applications. We used this tool to show the initial startup impact of each of the three embedded servlet containers. The heap size and thread counts are key in analyzing this initial footprint. The ten threads that are common to all three containers include: JMX server connection timeout, RMI Scheduler, RMI TCP Connection (2), RMI TCP Accept, Attach Listener, DestroyJavaVM, Signal Dispatcher, Finalizer and Reference Handler. While all three of the embedded servlet containers had similar performance under the parameters used in this example, Undertow seems to have the best performance with Tomcat and Jetty close behind. The memory footprint of Jetty on startup was the largest using 311 MB. Tomcat and Undertow had similarly low initial footprints around 120 MB with Undertow coming in the lowest at 114 MB. The key difference in the response headers is that Undertow includes HTTP Persistent connections by default. This header will be used in clients that support persistent connections to optimize performance by reusing connection details. The numbers indicate that Undertow is the best in performance and memory usage. It is encouraging to see that Undertow is embracing the latest capabilities and defaulting to persistent connections. The numbers do not indicate a dramatic difference in performance based on the load used in this example but I would imagine that they would scale and that if performance is the most important factor Undertow is the right match for your application. It is also reasonable to think that an organization may favor an embedded servlet container because of familiarity with it’s capabilities. Many times the defaults settings will have to change because of application requirements that include performance, memory usage and functionality. Here we compared three types of embedded servlet containers you can include in a Spring Boot Application. 166,443 insiders are already enjoying weekly updates and complimentary whitepapers!